Old map by Aa -Nova Delineatio Totius Orbis Terrarum. 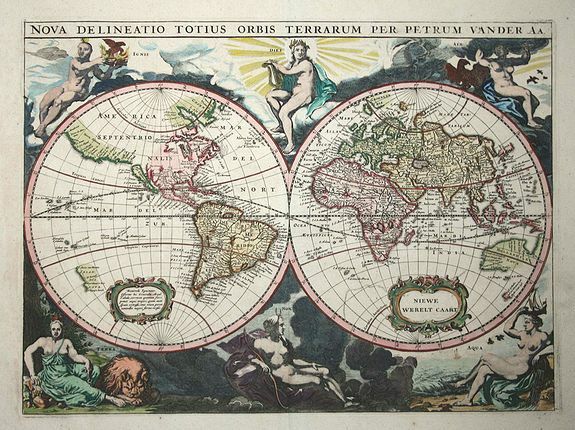 Title: Nova Delineatio Totius Orbis Terrarum. Size: 10.2 x 13.6 inches. Condition: Very good, with wide margins. Originally engraved by Jacob van Meurs in 1660, and reissued here by Vander Aa, this map is based on Arnold Colom's wonderfully graphic map from the first world maritime atlas. California is an Island, separated from Nova Albion, which stretches towards Asia and off the map. The western coast of New Zealand appears, as do several other important Pacific islands. Australia is partially mapped and only the southern tip of Tasmania appears. 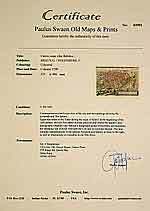 Each hemisphere includes a strapwork cartouche, one with the Dutch title Niewe Werelt Caart. Superb engravings surround the map with six statuesque female allegorical representations of the Goddesses of Day and Night and the elements of Fire, Air, Water and Earth.